Specimen collection number SCL 15342 in the UBC Herbarium Algae Databse. Search the collection number in the database for more information on this specimen, or search the species for further occurrences. Images courtesy of Sandra Lindstrom. 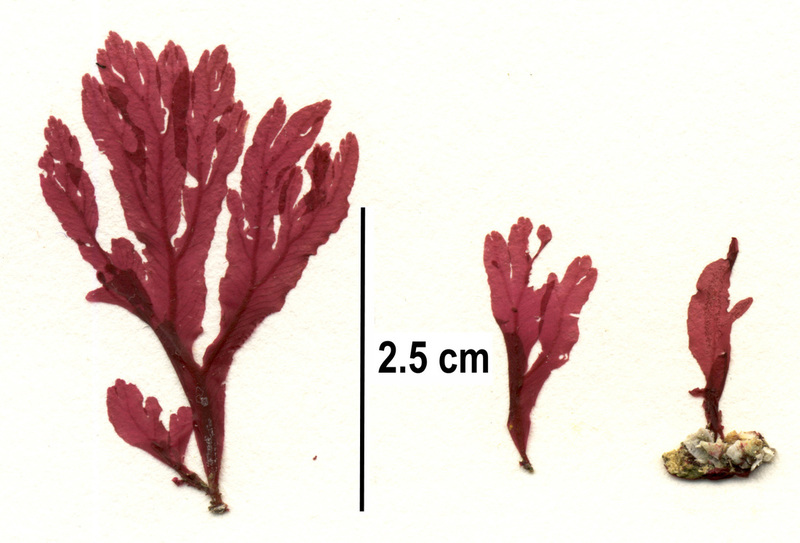 This red alga is named for the feather-like appearance of its delicate veins, which branch pinnately off a strong midrib. 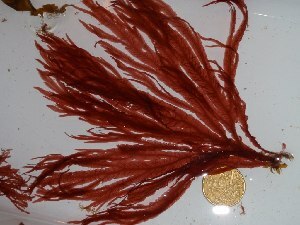 Feather-veined red seaweed has thin, narrow blades that reach 10 cm long, and a disc-shaped holdfast. Click here for more photos. 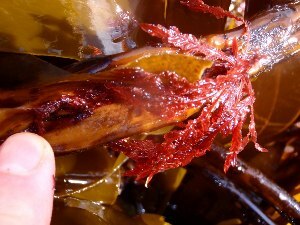 Feather-veined red seaweed grows on rock, pilings, and other kelp in the low intertidal and shallow subtidal, from central Alaska to southern California. It has also been reported along the coast of eastern Russia. Guiry, M.D. & Guiry, G.M. (2015). Membranoptera platyphylla (Setchell & N.L.Gardner) Kylin. AlgaeBase. National University of Ireland, Galway. Accessed 15/06/2015.